This minute – 1,000,000 plastic bottles are bought. Less than 50% are collected for recycling. The rest? 10m tonnes of plastic waste end up in the oceans resonating around with marine lives. Based on the scale of our consumerism, there will be more plastic than fishes in our ocean by 2050. Biodegradation means an item that can break down into natural materials in the environment without causing harm. 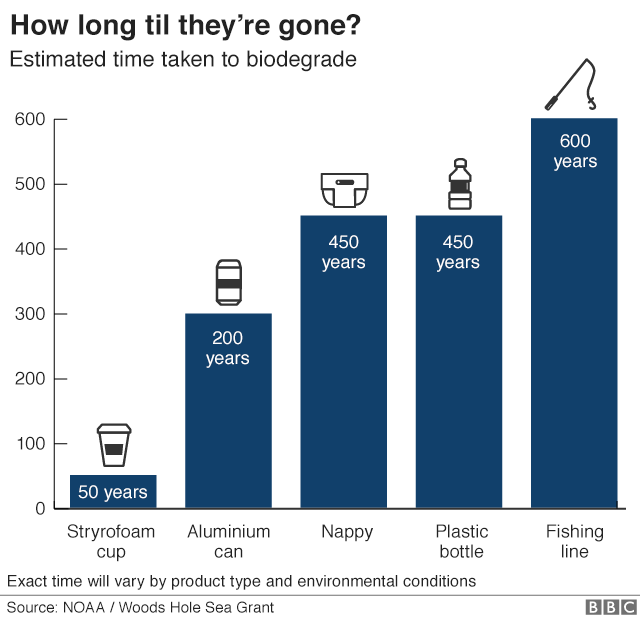 Based on a report by BBC, it takes an estimated 50 to 600 years for them to biodegrade. amount of years needed for the breakdown of materials. Plastic waste is just merely one reason that contributes to global warming. Understanding the causes and preventing it gives us an upper-hand in doing our part to save the planet. Here at Cotton Planet, our green initiative is to reduce plastic wastage. From April 2019, we will not be providing plastic packagings unless requested. Do your part. If it’s not necessary, skip it. Together, we can cultivate a green culture. 4 T-Shirt Printing Method: Which one suits your t-shirt the best?